Comments: Evergreen broadleaf native to California and found throughout the state except for the inland desert areas. 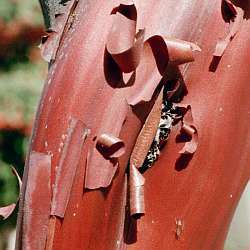 Waxy green 2" ovate leaves, small white flowers, dark purple berries and bright red to purple smooth bark. A large bush to small tree; broad spreading with 20' maximum height. A very drought tolerant plant which will die back if watered. 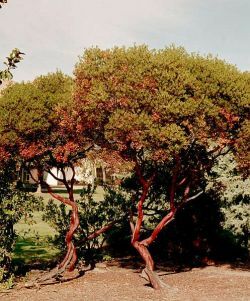 The wildfires in the canyons of Southern California often involve manzanita and other chaparral plants.